Coming from the land of continual summers (Mesa, Arizona), I am actually intrigued by the changes in seasons. The colors are amazing (the temperatures are not). I'm sitting here watching the biggest, blackest storm come over the mountains towards us and I am getting so excited hearing the thunder. When you grow up in Arizona you tend to get extremely pumped when it rains and storms. These times come few and far between for Arizonans, it's almost an adrenaline rush for me. 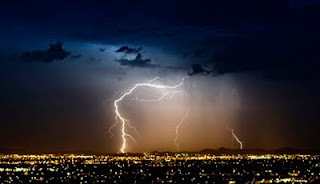 The best part of summer in AZ is monsoon season, I think it's everyone's favorite. It is safe to say I get more excited about a rainy day than I EVER have about a sunny one. Nothing is more invigorating to me than to sit on a patio and watch a storm, smell the rain, and hear the thunder. Okay... I MISS YOU GUYS! So glad to have found you have a blog. I am officially a follower. Now I can somewhat stay updated on how you are. Love you Ash!